Dr. Joseph Benjamin Johnson, Grambling State University’s third president died Tuesday (Jan. 2) after a lengthy illness. 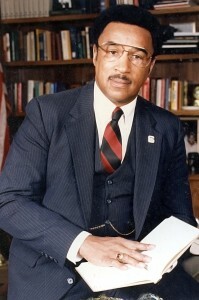 Johnson, a longtime favorite president who served from 1977 until 1991, succeeded Ralph Waldo Emerson Jones, who served Grambling from 1936 until he retired. Johnson, who fought to save the school from financial failure as state and other challenges threatened its existence, led student enrollment growth from 2,600 to a record-setting 7,000-student enrollment. Johnson pushed for and got a September 8, 1981 consent decree between the State of Louisiana and the U.S. Department of Justice. He worked with Lamore Carter, vice president and provost, and attorney Thomas N. Todd to research and prove that Grambling deserved greater support. That effort resulted in new campus building construction, employee raises, and new academic programs, including the creation of the School of Nursing in 1983 and the first doctoral developmental education program in 1984. These and other significant improvements quickly established the university as a major institution on the move as it grew stronger and created a greater academic focus. Academic and education leaders across the nation said Johnson was responsible for becoming a comprehensive university with strongly enhanced academic program offerings. Some reports say Johnson inherited a $7 million deficit and the consent decree allowed him to pay off that debt and implement big changes with an operating budget of $125 million. In a Tuesday night interview, Todd, who Johnson asked to represent the school’s national alumni association, said Johnson was the leader, the cog and the force behind the consent decree. “The key was Dr. Johnson and his willingness to stand up to authority and to stand up for Grambling,” he said. “His work resulted in Grambling getting $300 million” to grow the institution. Johnson led a significant number of changes at the institution. Though it is common these days for higher education institutions to have online registration, Johnson implemented an online registration process in 1987. He was president as head football coach Eddie Robinson continued to rise in prominence nationally, becoming the winningest football coach. A masters in criminal justice program was launched during his tenure. He not only started the school’s nationally recognized nursing program, he successfully sought $50 million to build a nursing school. Once he left Grambling State in 1991, ending 14 years of leadership at his alma mater, he became president of Talladega College and served there until he retired in 1998. Before Johnson was Grambling State’s leader, he was a student at the school. When he signed on to play in 1954 he played basketball under Eddie Robinson, who coached basketball and football at the time, playing alongside some of Grambling greats, something that Johnson would joke about from time to time. “I played with Bob Hopkins, and Bob was the nation’s leading scorer,” Johnson said in one interview, mentioning “Hambone” Hopkins, a Jonesboro native GSU athlete who went on to play pro basketball. “I was the quarterback of the 1955 team. I was to Grambling’s championship team what Bob Cousy was to Boston. If Bob Hopkins was the nation’s leading scorer, then I must have led the nation in assists because somebody had to pass him the ball.” No stats for assists were kept, so there’s no telling what the record showed. Johnson was inducted into the Grambling Legends Sports Hall of Fame as a part of a class of 15 several years ago. Johnson had an impact across the State of Louisiana, and colleagues and friends from Grambling to Jonesboro to Chicago reacted to his death. Yvette Mansfield Alexander, a Baton Rouge city judge, Louisiana, recalled Johnson’s beginnings as the university’s leader. “He came in with a Grambling heart and a sturdy, father hand. It was just what Grambling needed,” she said. “He only wanted the best for his, and my, dear ole Grambling. Johnson was a member of a number of civic, professional and social organizations, including Phi Delta Kappa and Kappa Alpha Psi Fraternity Inc. He and his wife, the late Lula Young Johnson, are the parents of four adult children, Yolanda Johnson Dixon, an attorney and Assistant Secretary of the Louisiana Senate, and triplets – Julie, a medical doctor; Juliet, a Fisk University administrator, and Joseph III, an actuary and financial analyst. He was the son of the late Lillie M. Johnson and the late Sidney T. Johnson of New Orleans. At Johnson’s request, the Johnson family said there will not be a funeral service, according to Gallot, who said GSU will honor Johnson soon.